G’day Casino is part of the Imperium Network Solutions Limited group, and was released in 2013. It holds a gambling license from Curaçao and UK authorities. 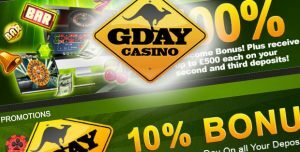 The theme of the G’day Casino is designed to attract customers that love the true spirit of Australia. The 2015 redesign of the website improved the Australian features and made the interface more fun, interactive and friendly. The cute kangaroo logo is what remains of the original site design, but all the other features are changed. The Sydney skyline, the crocodile and the assistant dressed in Australian themed uniform are all subtle elements reminding you of Down Under. zer pokies, pokies (slots), jackpot pokies, live casino, blackjack, roulette, table, poker, fun & scratch, bingo & keno and virtual. Security is taken extremely seriously. The payment processor is overlooked by FSA, and the casino has a 128 bit SSL encryption, which does not allow third parties to look at your account and banking information. NetEnt, NYX Interactive, Leander Games, E Zugi, White Hat Gaming and Betsoft are some of the top gaming developers that provide content for G’day Casino. Players have access to the most famous slots: Arabian Nights, Queen of Thrones, Mega Fortune, Hall of Gods, Dragon Drop and many others. Tables games include many Blackjack variations, as well as Roulette, Baccarat, Craps, Pai Gow, Caribbean Stud and many others. Blackjack, Baccarat and roulettes can be played in the live version, which is broadcasted from a dedicated studio. The first deposit you make at G’day Casino is 100% up to infinity. Players that deposit $100 and over into their account will also receive a case of free beer. The second deposit is awarded with 25% up to $500 and the third with 50% up to $500. You will need to deposit a minimum of $10 to receive the bonus. The bonus has to be wagered 35 times before it can be claimed for withdrawal. A $10 no deposit bonus is offered to those players that do not want to gamble on real money from the beginning. The winnings generated by this bonus are not cashable. A “Refer a friend bonus” will entitle you to free cash. Your friend has to deposit minimum $20, and you will get $25. It will take up to 7 days until the bonus appears into your virtual account. You have to provide the details of your friend to the casino before they register. Also, you will lose your bonus if your friend will withdraw their money before they wager it at least once. In addition, an ongoing 10% deposit bonus will give 10% up to $50 per day, for every deposit that you will ever make into your account. The wagering requirements are 35x. The website is accessible from mobile devices that run on iOS and Android operating systems. Registration and famous games such as Starburst and Gonzo’s Quest are available from any smartphone or tablet device. Deposits and withdrawals are available with Visa, Mastercard, bank transfer and e-wallet solutions such as Neteller, PaysafeCard, POLi, Skrill and Ukash. The minimum withdrawal is $50 and it might be subject to a 10% processing fee if the deposit has not been wagered at least once in full. The customer support program is every day between 9am to midnight, 7 days a week via live chat. Customers also have the option to look through the frequently asked questions section.